RYOBI introduces the 18V ONE+ Lithium-Ion Cordless Rotary Tool Kit with 1.5 Ah Battery and 18V Charger. A variable speed dial allows users to reach up to 34,000 RPM for enhanced performance. With 33 included accessories and on-board accessory storage, the Rotary Tool delivers convenience while completing a variety of applications. The 36-Inch flexible shaft pen design maximizes precision and comfort and the 1/8-Inch collet accepts most accessories. With rubber feet to reduce slipping and integrated hanging keyholes, the ONE+ Rotary Tool is easy to use and easy to store. Part of the Worlds Largest Platform of over 125+ Tools. 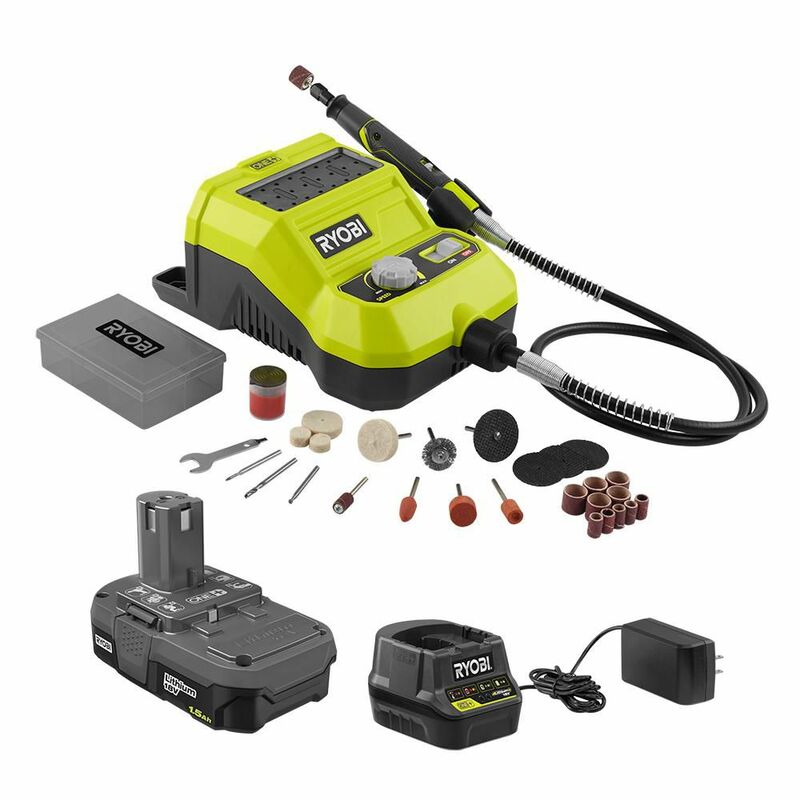 Backed by the RYOBI 3-Year Manufacturer's Warranty, this Rotary Tool Kit includes a P189 1.5 Ah battery, a P118B 18V charger, a 36-Inch flexible shaft, 33 grinding/cutting/sanding/polishing accessories, an accessory storage case, and an operator's manual. The Bosch CLPK203-181 18 V Cordless Combo Kit includes the Bosch HDH181X Brute Tough 1/2 In. Hammer Drill/Driver and the CRS180K Reciprocating Saw. The HDH181X has Active Response Technology with helps with bind-up situations. With an Open-Frame Four-Pole motor and all-metal gearbox, this drill/driver provides 750 Ft.-Lbs. of torque and 27,750 to power the toughest drilling tasks. It has a two-speed system one for high torque (0-440 RPM) and one adjusted for high speed (0-1,850 RPM). Its side handle pivots to 23 positions. The CRS180K is a handy reciprocating saw that also brings plenty of power, with a long and efficient 1-1/8 In. stroke, for more material removal per stroke. The saw features the easy Lock-Jaw blade-change system, for fast one-handed blade changes. This kit includes two 18 V FatPack batteries and a charger, to fully take advantage of the Bosch 18 V battery platform. The 2495-28 M12 Cordless Red lithium 8-Tool Combo Kit includes the 3/8 inch Drill Driver (2407-20), 1/4 inch Hex Impact Driver (2462-20), Hackzall Reciprocating Saw (2420-20), Right Angle Drill (2415-20), Multi-Tool (2426-20), M-Spector 360 (2313-20), Jobsite Radio (2590-20) and Work Light (49-24-0146). The innovative M12 Cordless system is designed to deliver the power and torque required for professional applications, in a size that reaches the tightest and toughest places. Powered by Red lithium, the M12 Cordless Lithium-Ion system offers unmatched power, speed and tool belt portability. The versatile Milwaukee M12 12-Volt Lithium-Ion Cordless Multi-Tool 2-Battery Kit is ideal for remodelers, flooring contractors, maintenance repair technicians and electricians. Perfect for flush or plunge cuts, removing grout or grinding thin set, sanding or scraping, this oscillating tool boasts 5000 to 20,000 OPM and allows you to match the speed to your application for superior results. Durable and built-to-last, the included universal adaptor makes this tool compatible with a wide-range of accessories for added versatility. 18V ONE+ Lithium-Ion Cordless Rotary Tool Kit with 1.5 Ah Battery and Charger RYOBI introduces the 18V ONE+ Lithium-Ion Cordless Rotary Tool Kit with 1.5 Ah Battery and 18V Charger. A variable speed dial allows users to reach up to 34,000 RPM for enhanced performance. With 33 included accessories and on-board accessory storage, the Rotary Tool delivers convenience while completing a variety of applications. The 36-Inch flexible shaft pen design maximizes precision and comfort and the 1/8-Inch collet accepts most accessories. With rubber feet to reduce slipping and integrated hanging keyholes, the ONE+ Rotary Tool is easy to use and easy to store. Part of the Worlds Largest Platform of over 125+ Tools. Backed by the RYOBI 3-Year Manufacturer's Warranty, this Rotary Tool Kit includes a P189 1.5 Ah battery, a P118B 18V charger, a 36-Inch flexible shaft, 33 grinding/cutting/sanding/polishing accessories, an accessory storage case, and an operator's manual. 18V ONE+ Lithium-Ion Cordless Rotary Tool Kit with 1.5 Ah Battery and Charger is rated 5.0 out of 5 by 2. Rated 5 out of 5 by JimmyFins from Amazing, love when Ryobi comes out with new products, Love this one you can take your rotary to... Amazing, love when Ryobi comes out with new products, Love this one you can take your rotary tool anywhere now and its variable speed.